We also offer exclusive all day Treks with lunch & refreshments supplied! For bookings contact our friendly staff on..
As Coral Bay's leading fishing charter we are constantly striving to make our anglers novice or experienced exceed their expectations. 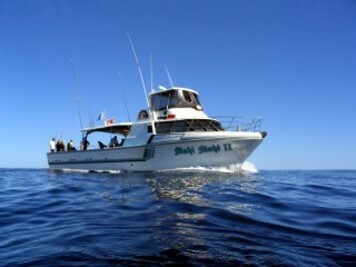 Your skipper Glenn Hill is renowned in the region for his local knowledge and experience. Our vessel the Valiant has a huge shaded deck and all the creature comforts to enjoy a day out on the Ocean. We guarantee a great day. Grant has Shell, Coral, Sterling Silver jewellery, gemstones and shells. Clothing, Sandals & Sarongs. Bikinis, Bathers & Billabong Board shorts. View his 24 Carat Gold Nugget collection. Johnny DaCosta invites you to Fins Cafe here in Coral Bay. Dine with us for breakfast, lunch and evening meals and enjoy our alfresco cafe ambience. 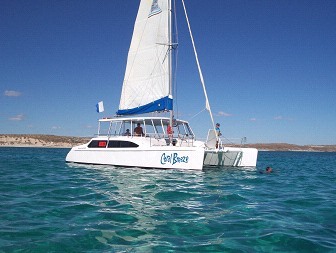 SUNSET SAIL 2 hours or book an exclusive charter for any occasion! For bookings contact our friendly staff on..
Want a stress free holiday? 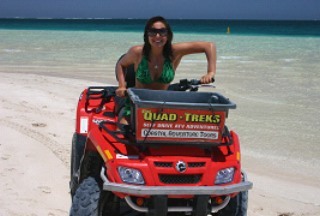 Let our friendly staff at Coastal Adventure Tours arrange all of your tour bookings while in Coral Bay! If you need information on Cape Range National Park, Exmouth tours & accommodation, Carnarvon, Ningaloo Reef, marine life, wildlife, road conditions & the local area our fully trained staff are here to help!. Find us in the shopping arcade – we have internet & ATM facilities! >For tour bookings or information please contact..